Please enquire for a quote! Product Description: The VW RNS-315 is a combined Radio, DAB, Nav and Bluetooth Package. It has a single CD Player and Media Interface with MP3 playback via CD/SD card slot. It is compatible with the latest MDI ipod kit(Optional), Genuine reverse camera(optional), opticle display PDC(optional), DAB Radio(included) and Genuine bluetooth phone kit(included). The system has a 5" touchscreen 400x240 and has an internal AUX-in, It has 4Gb internal flash memory for Mp3. 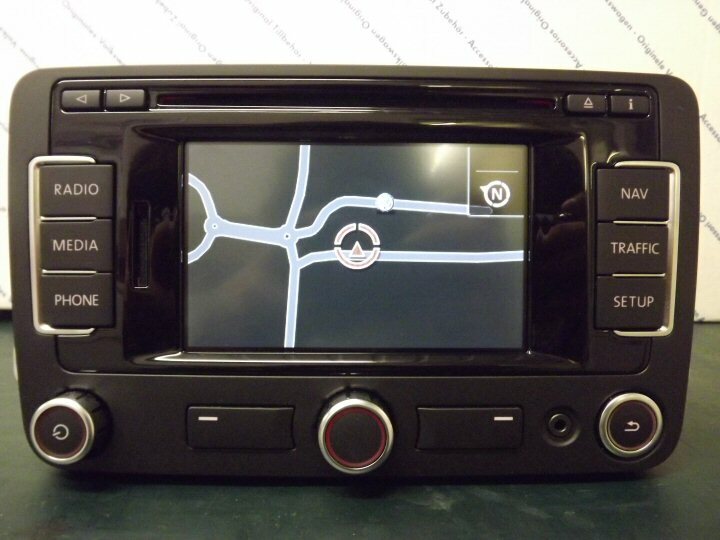 The Sat Nav comes with latest Maps pre-installed and now supports full 7 digit postcodes.Only genuine VW parts are used in the installation of this product. The work done can be done on a call out basis however this may be subject to a call out fee. Please Note: All vehicles prior to 2008 Require CAN Gateway upgrade. Please note: The RNS-315 is not compatible with the Red DIS or Mk5 Style MFSW. Some Model vehicles are excluded from the Reverse camera fitment list as they may require additional work and/or components for compleation these include the Vw Caddy and the Transporter varient with barn openning doors. If you desire those vehicles above to be fitted with RVC please contact the office for more information and a seperate quote. Vw RNS-315; The head unit as pictured above. MDI Kit; Vw Music Device Interface (Ipod lead included).